It’s that time of year again when people travel a lot of mostly to go back to their hometowns to spend the Holy Week break there. Many will also be going on leisure trips; heading to tourist destinations such as beaches, which are likely the most attractive places during this sweltering summer season. Most people will likely travel on land and would be taking public transportation in the form of provincial buses (while there will be more cars on the roads, more people will be on high occupancy vehicles). One wonders if the mode shares for these provincial trips could have been different at least for Luzon Island if the old PNR northern and southern lines were retained, maintained and modernised. What used to be the Main Line North stretched all the way to San Fernando, La Union with stations at most major cities and towns in Bulacan, Pampanga, Tarlac and Pangasinan including Malolos, San Fernando (Pampanga), Angeles City, and Dagupan City. Meanwhile, the Main Line South stretched all the way to Legazpi City in Albay with stations in the provinces of Laguna, Quezon, Camarines Norte, Camarines Sur and Albay. These included stations in Calamba, Los Banos, Sta. Cruz, Lucena and Naga. Surely, more people would have taken the trains for these long distance trips if the rolling stock were a lot like those operation by Japan Railways? I spotted this ad at a nearby SM mall listing churches that can be part of a Visita Iglesia itinerary in the Province of Rizal. I took the following photos showing the major churches in the province. These include old churches found in the older towns including those in Morong (ca. 1620), Taytay (ca. 1630), Pililla (ca. 1672), Baras (ca. 1686), San Mateo (ca. 1716), Tanay (ca. 1783), and Binangonan (ca. 1800). Antipolo has one old church – Boso Boso Church (ca. 1669). The Shrine of Our Lady of Peace and Good Voyage while being the more famous of the two was completed in 1954. The first church though was completed in 1632 but was destroyed several times due to unrest, earthquakes and the Second World War. Cainta also had an old church (ca. 1707) that was destroyed several times including during WW2, and the new church was completed in 1968. We’ve visited many of these churches before but are no longer into the Visita Iglesia considering our experiences of traffic congestion the past years when this tradition became more of a tourist thing or gig. We’d rather go to a nearby church to pray or stay at home to enjoy the peace and quiet; not to mention the comforts of being at home. I have yet to post a few more articles about my trip to Naga City,Camarines Sur and yet here I am traveling again, this time to Baler, Aurora. I have made it a point to travel to at least one new destination every year and this year it looks like I will be traveling to at least one new local destination and perhaps one new place overseas. So I will be concluding March by sharing this photo of two bancas (the type with the outriggers for balance) I took earlier this morning during my stroll along the beach. These boats are used by fishermen though they can also be used for transportation along the coast. These are the non-motorised type so it takes some skill and constitution to paddle these vessels especially when the waters are choppy. I promise to post more about this trip soon including sharing photos of arches and the dam roads of the Canili River Reservoir and the Diayo River Reservoir in Maria Aurora town. It has been a while since I had a long road trip. The last one was not particularly long as it was only until Lucena City in Quezon. Prior to that was a trip to Baguio City. And so I am looking forward to this trip to Bicol this week and I do hope to take a lot of photos along the way. That includes photos of arches that I have not had the chance of taking that I know I can get a lot of during this trip that will take us through several provinces in Southern Luzon. Those photos and the experiences from the trip will probably dominate the postings this February. When we were residing in Singapore, it was so easy to book a taxi wherever we might be. Comfort Taxi’s booking system allowed us to get a taxi from our home to the airport or to avoid long queues at the mall by booking a taxi by phone and waiting for it at a designated stop nearby. With the arrival of GrabTaxi and EasyTaxi in the Philippines, getting a cab became a little easier and convenient though one friend opined that the app basically mainstreams the current practice of negotiating with the cab driver for the fees (usually higher than the meter fare for metered taxis) to be paid for a ride. Hindi pa kasama ang tip dito! This ‘negotiating’ is a ‘trial and error’ thing and in certain cases, there might not even be a negotiation for the fares as Metro Manila cab drivers are notorious for being choosy about their passengers and their destinations. Here are a few screen grabs from a booking we made last month after having some difficulty getting a ride out of UP Diliman in Quezon City. Information about the booking fees in various Philippine cities. The booking fee in Manila is conspicuously and significantly higher than those in other major cities. Grab Taxi’s interface shows the number of taxis nearby, which is apparently the number within something like a 4 or 5-kilometer radius of our location (204 is a big number!). We were at Melchor Hall at the time and the most convenient pick-up location was at the National Center for Transportation Studies, which was behind Melchor Hall. You can also check out the availability of more exclusive (and expensive) Grab services such as GrabCar and GrabCar Premium. When you slide to GrabCar, the status bar will also show how many drivers of that service option are nearby (i.e., 20 drivers nearby for GrabCar). GrabCar would be similar to the basic service (and vehicle) provided by the more popular Uber. GrabCar Premium is probably the equivalent of the Uber Black Car service we have in Manila. Another view of the user interface showing some (or many) of the 204 taxis nearby. 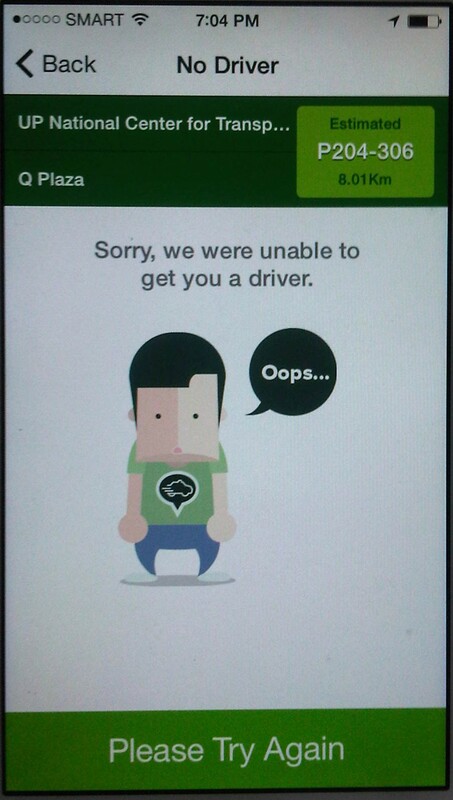 Here is an example of a message from GrabTaxi after it was unable to get a cab for us. We were fortunate that the failed attempt at getting a cab was once only as we got a cab in our next try. This is despite all the cabs supposedly nearby. In reality only those who are willing to go to my destination from Quezon City will initially be interested in taking my request via the app. There is also a gratuity feature of GrabTaxi that allows the user to indicate how much he/she would be tipping the driver on top of the fare and booking fee. In the end, I guess my stating a very generous tip ensured my successfully getting a cab. For this, my friend’s opinion seems to be true that apps such as GrabTaxi mainstreams or makes the negotiations formal and a given when using the app. It, however, already eliminates the part where the prospective passenger gets turned down by the cab he/she hailed. When a cab responds to a request via GrabTaxi, EasyTaxi or even Uber, the driver already agrees to the terms of the deal regarding the ride. And it is a good thing that these apps now feature feedback mechanisms (e.g., rating the drivers) in order to weed out those that are still uncooperative, greedy or want to take advantage of the need for taxi service. GrabTaxi now has a new service, Grab Express, which is an on-demand pick-up and delivery service. This is a service already provided by other companies in the US that are now giving traditional or conventional courier/logistic companies a lot of competition. I would think there is a demand for such services especially in cities where documents and other stuff still need to be submitted to offices like reports, manuscripts, letters and others that need to be delivered in “hard copy” format. The Rizal Provincial Government and the Antipolo City Government recently posted traffic rerouting schemes on their Facebook pages. Lalawigan ng Rizal was the first to post schemes that affect traffic in at least 3 major local government jurisdictions – Antipolo, Cainta and Taytay. The schemes affect the two major corridors that basically lead to Antipolo’s National Shrine of Our Lady of Peace and Good Voyage (or Antipolo Cathedral to many) – the Ortigas Avenue corridor and the Marcos Highway-Sumulong Highway corridor. There are many major and minor routes connecting to these corridors and are clearly seen in the maps. Within Antipolo, there are also re-routing schemes, which the Antipolo City Government posted along with a “clearer” re-posting of the maps from the Rizal FB page. The Antipolo FB page includes information/maps on the rerouting within the city center. These schemes will affect traffic circulation including public transport routes. Critical would be the permanent and temporary terminals and parking areas set-up around the city that should be able to accommodate the thousands of vehicles that are also expected to be used by people who won’t be walking or cycling. What the maps basically say is that from 4:00 PM today, Maundy Thursday, to 6:00 AM tomorrow, Good Friday, the stretch from Cainta Junction to the Shrine will be closed to traffic. This is to allow the hundreds of thousands expected to make the trek to Antipolo to have the road for themselves. What the maps don’t say is that motorcycles and tricycles would likely be allowed, too. I can understand that motorcycles could easily squeeze into the throngs of people but then allowing tricycles to operate among the walkers and bikers would be risky given their drivers’ behavior. Add to this that they would be making a killing out of charging opportunistic fares. Technically, the rerouting schemes don’t appear to be as well thought of as can be expected from the LGUs. Baka ito lang nakayanan ng staff o ng consultants nila, and surrender na agad ang Rizal and Antipolo with regards to the coming up with more options for people to travel to the Antipolo Shrine? Not all people can walk or cycle but are willing to an could take public transport for their pilgrimage. The maps themselves are a bit crude and the Province of Rizal and City of Antipolo could have done much better maps given the resources of these LGUs. There are open source tools now available as well as your basic software like PowerPoint or Photoshop (even Word!) that can be used to render good quality images to guide people making the Alay Lakad. This is a regular event and though it happens once a year then perhaps the LGUs could have better plans especially to transport people who cannot make the walk to Antipolo. The objective after all is to convey the masses to and from the shrine safely and efficiently – something a mass transport system can do whether via Marcos/Sumulong or Ortigas corridors.